Pawsitive Impressions: KNOWLEDGEABLE & NEIGHBORLY service led to a lifelong PSP Neighbor! KNOWLEDGEABLE & NEIGHBORLY service led to a lifelong PSP Neighbor! This letter comes from a neighbor in Buffalo Grove, IL. Pat on the Back to Charles for his exceptional neighborly and knowledgeable service. 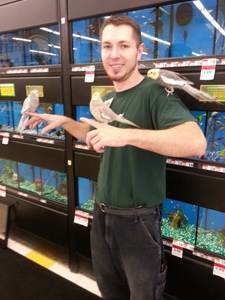 "Wow, I just had the most delightful experience buying dog food from one of your employees here in Buffalo Grove, IL. His name is Charles, and he was very knowledgeable about brands/ types of dog foods. He was also personable and it was very evident to me that he loves his job. Here's what happened: The brand dog food I had been buying was Evo. As you know, recalls were ordered by the manufacturer. So I threw out the rest of the food I had here at home, but then was left with nothing. Since I had been ordering Evo online to be delivered to my house, I hadn't actually been shopping for dog food in a long time. When I walked into Pet Supplies Plus, I was totally overwhelmed by the sheer volume of dog food on the shelves. Honestly, I was just about to walk back out of the store when Charles came to my rescue. He spent a lot of time with me and gave me some valuable insights into the differences among the brands. We had just decided upon a local brand, Evanger, and had placed bags and cans into my cart when the rep for that company just happened to come into the store! Charles asked him if he had any coupons to give me and the rep went back out to his car and handed me several that totaled $7.00 in savings for me! I've cancelled my on-line account with PetFlow and will do my shopping exclusively at this store from now on. Congratulations to Charles for winning a new customer for life. Well done." Great job providing neighborly service, Charles!!! That's awesome Charles! Way to go!